The Tooele 30′ x 60′ quadrangle (green outline) contains major faults related to periods of compression (blue) and extension (red). Sawteeth on upper plate of thrust faults. Bar and ball on down-dropped block of normal faults. No decoration on tear faults or faults of unknown displacement. 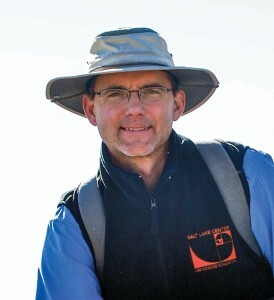 Don Clark joined the Utah Geological Survey in 2004 as a mapping geologist. He has authored/coauthored 15 geologic maps in central and northwest Utah, and considers himself fortunate to have collaborated with experienced geoscientists at the Utah Geological Survey, U.S. Geological Survey, universities, and industry. His current focus is on 30′ x 60′ quadrangle mapping in Utah’s Basin and Range Province. With one of the largest open-pit copper mines in the world, parts of four military testing and training ranges and installations, large industrial centers, Great Salt Lake mineral extraction operations, and mega-scale waste management facilities, Tooele and western Salt Lake Counties are Utah’s mining, industrial, and military heartland. These operations, which support thousands of jobs and provide hundreds of millions of dollars of cash flow, are an essential part of Utah’s economy. They also all have one common denominator: geology. Each operation is strongly tied to the land. A thorough understanding of the geological environment is essential to long-term profitability, protecting infrastructure from geologic hazards, and protecting the environment. The UGS is nearing completion of one of the most sought-after geologic maps in Utah because it will be at the foundation of many studies and decisions related to these issues. The Tooele 30′ x 60′ quadrangle geologic map covers part of this key area along the Interstate 80 corridor, straddling urban and rural areas that have large tracts of federal, state, and private land. The map is the culmination of decades of geologic data collection by numerous geoscientists; we touch on just a few aspects of this compilation here. The exposed rocks and sediments in the map area span about 2 billion years of geologic time, from Utah’s basement rock at Antelope Island to grains of sand, silt, and clay deposited today in streams and dunes, and mud and oolites in Great Salt Lake. The area has been affected by two primary periods of structural disturbance and deformation. An older period (Cretaceous to Eocene, 140 to 50 million years ago), attributed to collision of tectonic plates to the west, formed the Sevier fold-thrust belt in Utah. Compressional structures include folded rock, thrust faults, and tear faults. Similar to working on a complicated jigsaw puzzle, geologists have gradually unraveled the chaotic geometry of these compressional structures. We now have a better picture of some aspects of the thrust belt, but other details remain unclear due to the blanket of younger rocks and sediments in the valleys, scarcity of subsurface information (deep drill holes and geophysical data), and the lack of deposits similar in age to the deformation. The Tooele map updates current thinking on the fold-thrust belt architecture and can assist with resource management issues. A younger period of deformation, referred to as basin and range extension, occurred from 20 million years ago to the present. In contrast to the earlier compression, moving tectonic plates caused east-west stretching across the Great Basin, ripping the crust into large blocks along numerous northsouth- trending normal faults. This created the distinctive basin and range topography of mountain ranges with intervening valleys. In the Tooele quadrangle, some normal fault zones are young enough to cut young surficial deposits along valley margins in Salt Lake, Tooele, Skull, and Puddle Valleys. Mapping of the fault zones is critical to evaluating the associated seismic risk. A major normal fault zone follows the western margin of the Oquirrh Mountains before heading under Great Salt Lake. Tooele map coauthor David Dinter, geologist at the University of Utah, employed seismic geophysical techniques by boat to map the normal faults underlying Great Salt Lake. His mapping shows the fault zone extending northward on the west sides of Antelope Island, Fremont Island, the Promontory Mountains, and Rozel Hills; in addition, a fault splay exists north and west of Carrington Island. Some of these younger faults cut young lake bed sediments, but others are older and do not. Additionally, the UGS and U.S. Geological Survey have collected numerous geophysical data in the Tooele quadrangle and adjacent areas. These data will be used to evaluate basin geometry and depth, and the potential for additional fault zones. Much of the blanket of Quaternary deposits on the lower parts of the mountains and in the valleys is related to late Pleistocene (Ice Age) Lake Bonneville. This huge lake, which covered one-third of Utah, was centered near the northwest corner of the map area and existed throughout the Last Glacial Maximum. The extensive lake deposits and paleoshorelines have been studied in detail by Tooele map coauthor Charles “Jack” Oviatt, emeritus geologist at Kansas State University. Oviatt has helped document the chronology of the lake as it developed from 30,000 years ago, transgressed to its maximum at 18,000 years ago when it flooded catastrophically into the Snake River of Idaho, and as the climate dried and warmed, shrunk to its salty demise 11,500 years ago. Oviatt’s focus on the lake has culminated in a recent (2016) compilation entitled Lake Bonneville— A Scientific Update (Oviatt and Shroder, editors; see page 5). Great Salt Lake has also waxed and waned over time due to climatic fluctuations, but because of lack of data and other complications, we know much less about its overall chronology. The quadrangle hosts numerous geologic resources we use in our daily lives. Easily visible (even from space!) is the Kennecott/RioTinto Bingham Canyon mine in the Oquirrh Mountains. One of the largest copper mines in the world, it has a long history of mining (since 1863) and later porphyry copper production (since 1906), including gold, molybdenum, and silver resources, and is projected to continue production into 2028 (see related GeoSights article in this issue of Survey Notes). Industrial minerals are also extracted for use and include sand and gravel primarily from Lake Bonneville shoreline deposits, and limestone and quartzite from Paleozoic bedrock. The salty waters of Great Salt Lake are distilled down in expansive evaporation ponds to provide salt and magnesium. Yet, probably the most precious resource in a state with a dry climate and ever-growing population is water. The mountains of the quadrangle are important recharge areas and the valleys have large freshwater aquifers. Underground geothermal resources of the area are largely untapped. Intermediate-scale maps, such as the Tooele 30′ x 60′ map, provide an important geologic framework for evaluating these water resources. Although sometimes forgotten, Great Salt Lake also contributes to our water supply by inducing lake-effect storms that significantly increase the snow pack in the mountains in and near the quadrangle. Lastly, one cannot forget world-class recreational sites including Antelope Island State Park, Great Salt Lake, wilderness areas in the Stansbury and Cedar Mountains, and other public lands.